It’s about time for a Prague post, right? Sterling and I left on a Friday night and spent the weekend there. Safe to say it was my favorite weekend trip to date. I still can’t get over the fact that you can just hop on a bus or train here in Europe and end up in another country a few hours later. Since we only were there for a weekend, Sterling and I only brought one backpack each with us. That only left room for basically two outfits. Today I’ll be sharing this outfit with you. It has been my favorite “dressier” look that I’ve been wearing, not only just in Prague but in Berlin as well. Pants + Shirt: First up, I’ve got on these snake skin pants and this long sleeve shirt from Zara that I got on sale of course. I’ve had to be super careful about what I buy while I’m here because I only have a limited amount of space to bring things back. So after finding both the long sleeve and pants on sale I grabbed them. My style is super simple and plain and I love that. But sometimes I crave to wear a little color. If and when that’s the case, I’ll always wear a pop red, hence this shirt. Coat: This coat I actually bought last year from Banana Republic. I wore it on my last trip to Europe too! It isn’t the thickest coat, but it is SUPER roomy! So you can pile on the layers underneath. A little trick I’ve found is wearing vest underneath helps keeps the heat in. It keeps you so much warmer rather than simply wearing a shirt and sweater. Shoes: And of course I paired my Stan Smith’s, that I’ve had for three years now, with this outfit. I am obsessed with them because number one, they are comfy! And number two, they go with every outfit. Accessories: I got this belt for $3 from Mango. I couldn’t find a link to the same belt because I believe it was on clearance, but I found a similar style. I bought it because, well just look at it! It adds a little more pop to my look. Lastly, this bag comes everywhere with me. I just love it! 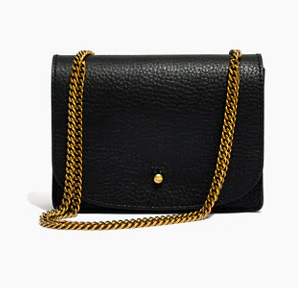 It’s black (my favorite) and of course has a gold chain (my other favorite). Butttt… if I’m being 100% honest, it’s not the most practical for traveling. Luckily Sterling was wearing her Fijal Raven and I was able to stash a couple more items into it. So I would have to say, it’s not the most travel friendly, but it is super cute! I hope you liked this post. If you’re interested in seeing more Prague content, check out the Vlog I mad while I was there. It’s one of my favorites.